China, Japan, and South Korea together account for 90 percent of East Asian GDP and 20 percent of global GDP, a higher share than the European Union. However, trade between the three countries takes up less than 20 percent of their overall foreign trade. There is much opportunity for greater trade and growth to the benefit of all three countries. The three countries would enjoy great economic benefits from the Agreement. It is estimated that the formation of the free trade area would increase China’s GDP by 2%, Japan’s by 0.3% and South Korea’s by 2.8% compared with their mean GDPs in 2015 (1). Since China, Korea, and Japan are currently at the low, middle and high ends of world industrial chain respectively, the three economies are highly complementary, and would continue to gain benefits from a large, shared market. Joining the agreement would require China to reduce market interventions and withstand external shocks to its domestic market, especially in the field of electronics. This reduction would be a challenge, but would also be a great opportunity for domestic reform. China would have to strongly push forward reforms in many fields of the market economy, such as a reform of state-owned enterprises and intellectual property protection. While these steps would be difficult, they would largely foster the country’s economic vitality. Furthermore, China could use this Agreement as a counterbalance to the Trans-Pacific Partnership (TPP). If the three countries approve the Agreement, it would form a free trade area larger than that of North America, with similar economic power. This newfound power could persuade Pacific countries to abandon the TPP and join the Agreement because, compared with the TPP, the Agreement is a reciprocal economic policy, not a political tool. Also, the Agreement would raise China’s bargaining leverage if it seeks to join TPP in the future. More broadly, an Agreement would advance the integration of Asian economies, and China would be able to lead this process. Building on the foundation of the Agreement, China could further facilitate the passage of the Regional Comprehensive Economic Partnership (RCEP), which is a proposed free trade agreement between 10 ASEAN member countries and the six states with which ASEAN has existing free trade agreements, including the three East Asian countries. The whole region’s status in world economy would rise. As the leader of the integration process, China would finally become a maker of the world economic order rather than a taker, and would obtain a position in the world economy that matches its economic power. The integration of East Asia has achieved little in the past decades, mostly because of some issues left over from history. For example, Japanese politicians denying the Nanking Massacre and controversies over Japanese history textbooks have harmed China’s bilateral relationship with Japan. 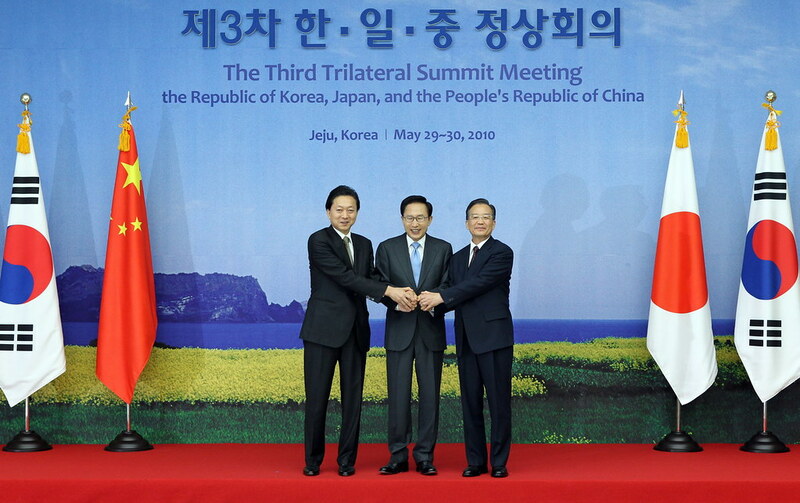 Furthermore, the territorial disputes over the Diaoyu/Senkaku Islands between China and Japan, as well as the Dokdo/Takeshima islands between South Korea and Japan, have been large barriers to the negotiation of the FTA. However, if the three countries could learn from the history of European integration and seek to achieve economic goals above political ones, then they could build mutual political trust on the base of interdependent economic relations. This trust would require China’s willingness to share the leading position of the economic integration of East Asia with Japan and give up some economic benefits during the FTA negotiations. If China were willing to give up these benefits, it could persuade Japan to acknowledge the existence of territorial disputes, and then shelve these disputes in the face of greater economic interests. Also, South Korea, as a traditional promoter of East Asian regionalism (2), could be attracted by the economic benefits and persuaded to overcome historic bitterness towards China and Japan. Once China, Japan and South Korea form a free trade area, these three countries with similar culture would continue their rich history in economic exchange and interaction. An agreement would push forward the integration of Asia’s economies. The whole of Asia, along with the rest of the world economy, would benefit from their intimate and interdependent relationship. 1.) Hyungdo, Ahn, Lee Changjae, and Lee Hongshik. "ANALYSIS OF A CHINA-JAPAN-KOREA FREE TRADE AREA: A SECTORAL APPROACH." In New paradigms for transpacific collaboration: symposium sponsored by The University of Washington, The Korea Economic Institute, and The Korea Institute for International Economic Policy, October 16-18, 2005, p. 1. Korea Economic Institute of America, 2006. 2.) Francoise Nicolas. “Korea and Economic Integration in East Asia: The Way Forward.” Korea's Economy Vol. 28 (2012): 87-93.